Jaguar’s new-for-2018 E-Pace is a tidy little case study in just how profoundly the new-vehicle marketplace—and specifically the luxury marketplace—has been transformed over the last decade or so. I keep imagining what it would be like if our E-Pace test vehicle could be dropped into a time machine and teleported back to a Jaguar showroom floor circa 2008. At that time, Jaguar’s lineup consisted of the X-Type, S-Type, and XJ (all of them 4-door “saloon” cars with heritage-themed styling cues), and the XK 2-door sports car. The E-Pace is Jaguar’s second foray into the crossover SUV market; it slots below the F-Pace in size and price. The E-Pace follows close on the heels of the new-for-2017 F-Pace—Jaguar’s first entry into the crossover SUV market—and is being followed up by the 2019 I-Pace, a pure-electric compact hatchback that blurs the lines between traditional vehicle genres even further. The E-Pace’s interior scores high marks for both form and function. The back-seat area is spacious enough for average-size adults to be comfortable… if the front seats aren’t adjusted too far back. If you can get your head around the idea of a pint-sized, premium-brand crossover SUV with a zingy turbocharged 4-cylinder, a performance-focused driving personality, and a $55K starting price tag, then you might be the target customer for our E-Pace R-Dynamic HSE test vehicle. The E-Pace offers respectable cargo room within its extra-compact exterior dimensions. There’s 24.2 cubic feet of cargo space behind the rear seats, and 52.7 cubic feet with the rear seatbacks folded down. The R-Dynamic HSE is the sportiest and priciest model in the E-Pace roster, save for a limited-run of specially trimmed First Edition models. 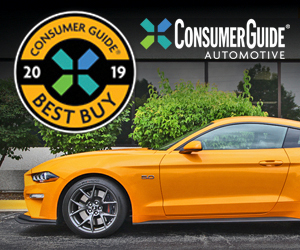 The lineup is broken down by engine output—P250 models are powered by a 246-horsepower turbocharged 2.0-liter 4-cylinder engine, while P300 R-Dynamic models get a more powerful 296-hp version of the same powerplant—and trim level: Base (P250 only), S, SE, and top-line HSE (P300 R-Dynamic only). A 9-speed automatic transmission and all-wheel drive are standard on all models. 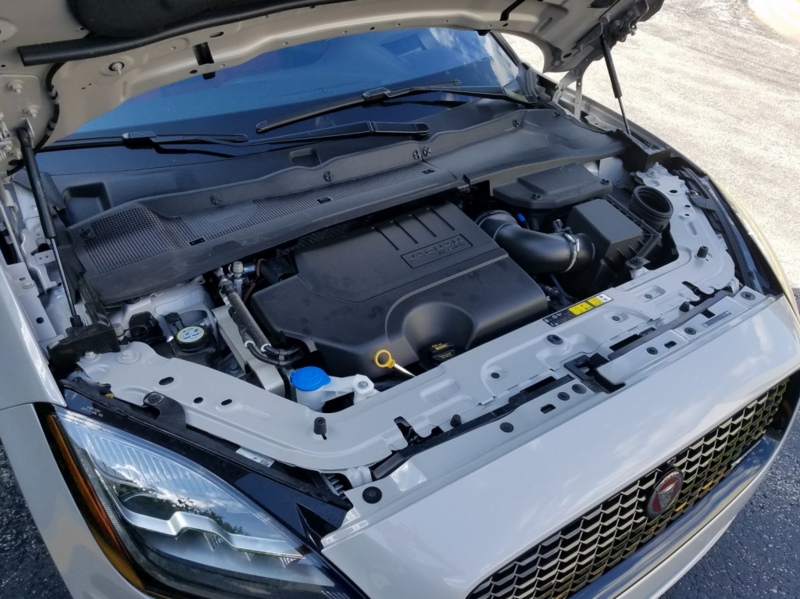 Our test vehicle was equipped with the more powerful of the E-Pace’s two engine options: a 296-horsepower turbocharged 2.0-liter 4-cylinder. Inside and out, the E-Pace is built with the high-end materials and excellent fit and finish of a premium-brand vehicle, but the emphasis is on contemporary sportiness over coddling luxury. Our test vehicle’s interior was trimmed with eye-grabbing Mars Red/Ebony color scheme, nicely accented by some well-placed satin-finish aluminum brightwork and aluminum pedals. 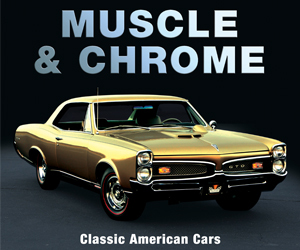 The leather upholstery has a high-quality look and feel, with precise stitching on the seams. The front seats offer a good mix of comfort and support—the just-right side bolsters help keep occupants in place in fast corners, but they’re not so snug as to be uncomfortable in everyday driving. Forward visibility is fine—the slightly elevated ride height helps a bit here—but rearward visibility is less than ideal. The short, steeply sloped rear window and tiny rear quarter windows are the main culprits. The standard rearview camera and 360-degree park-assist sensors are helpful, but we’d recommend supplementing them with the $360 surround-view camera system as well. The optional panoramic sunroof ($1225) is fixed, so it only lets in light—no fresh air. The lack of an opening sunroof is a bit of a demerit for some, but on the plus side, there is no bulky housing to intrude on rear-seat headroom. And, one neat feature: the sunroof’s power sunshade closes automatically when the vehicle is locked and then retracts when the vehicle is started again, to help keep the interior from getting any hotter than it has to be on sunny days. Considering its trim exterior dimensions and short wheelbase, the E-Pace provides decent passenger space inside. Headroom is excellent in front and better than expected in the rear, but legroom is a little cozy for tall occupants. Second-row legroom quickly gets scarce as the front seats are adjusted rearward, but the relatively tall body build and upright seating position help compensate. Rear-seat entry and exit is also not bad, thanks in part to adequately sized lower door apertures. 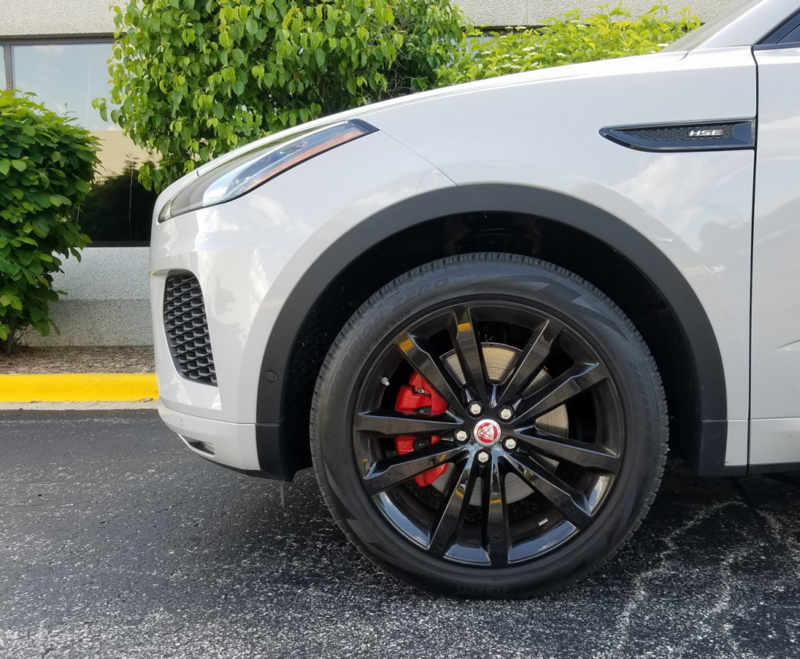 There’s $1140 of optional upgrades shown in this photo: red brake calipers ($410), 20-inch gloss black wheels ($510), and the Black Exterior Package ($220; includes gloss black grille and grille surround, side vents, and window surrounds). Cargo volume is better than in most class rivals, though the E-Pace is topped here by the BMW X1. The X1 offers 27.1 cubic feet of space behind the rear seats and 58.7 cubic feet with the rear seat backs folded, compared to the E-Pace’s respective measurements of 24.2 and 52.7 cubic feet. The E-Pace’s under-floor area is completely taken up by the spare tire, so there’s no extra stowage space there. There are chrome cargo tie-downs and a handy netted cubby area on the right-side cargo wall, however. We’ve no major complaints about the E-Pace’s controls. The digital gauge cluster is clear and nicely laid out, and we appreciated the large, easy-to-use rotary-dial climate controls. The “InControl Touch Pro” touchscreen infotainment system’s functions were intuitive, and the vehicle’s Bluetooth software was laudably quick to sync up to our Android smartphone. However, we found the action of the gear selector to be a bit finicky; selecting drive or reverse requires pressing a button on top of the shift lever, and we weren’t always successful on the first try. The driving personality of the P300 turbocharged 2.0-liter 4-cylinder engine is satisfyingly eager. Like many other high-output turbocharged fours on the market, this engine’s thrust isn’t particularly linear, but acceleration is quite sprightly once the turbo boost arrives. The exhaust note is occasionally grumbly at idle and in low-speed driving, but rises to a delightful, athletic growl in fast acceleration. The E-Pace’s EPA fuel economy ratings are 21 mpg city/27 highway/23 combined, but our own numbers were disappointing compared to those estimates. In testing that consisted of about 75 percent city driving, we averaged only 18.6 mpg. The Configurable Dynamics system ($360) offers four driver-selectable drive modes—Normal; Dynamic; ECO; and Rain, Ice, and Snow—that alter throttle response, transmission behavior, steering, and other parameters. In ECO mode, the automatic stop/start feature gets a bit more aggressive, and the throttle response is dialed back a bit. Some drivers might find the ECO setting a bit more pleasant than Normal or Dynamic mode, where the throttle response can sometimes feel a bit skittish at low speeds. 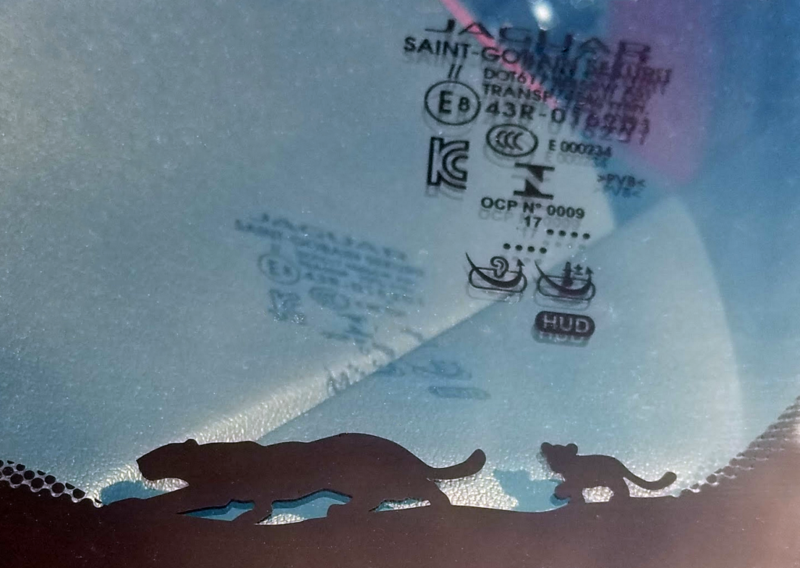 The E-Pace could be considered the “cutest” Jaguar, so the designers had a bit of fun with these silhouettes in the lower corner of the windshield. The rearview-mirror-mounted puddle lamps use a similar graphic. 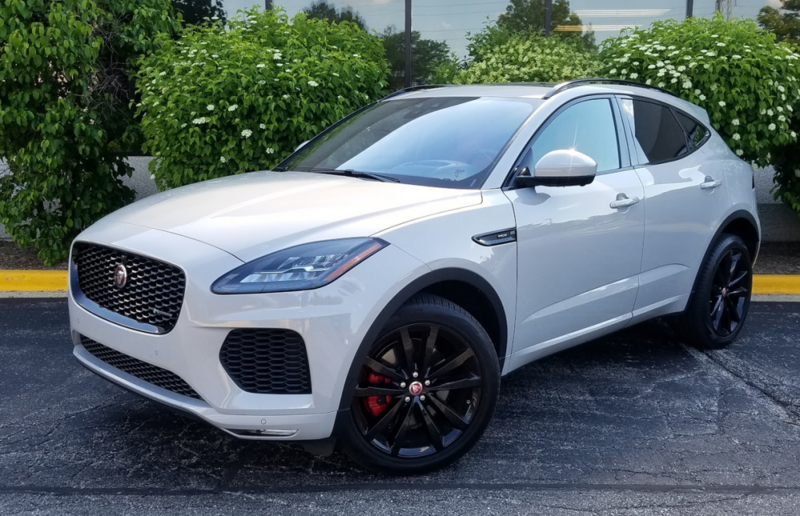 The E-Pace’s ride quality is in step with its athletic overall personality—it’s reasonably absorbent but always “active,” even on relatively smooth pavement, and can be a bit stiff over sharp bumps. Handling is pretty nimble for the class, though the tallish ride height and higher center of gravity from the tall body build make themselves known in fast cornering. Another question those circa-2008 Jaguar shoppers would have asked about that time-traveling E-Pace is “How much does this thing cost?”—and the answer would certainly have dropped jaws. The base price of the R-Dynamic HSE is a sobering $54,095, but our tester was optioned up all the way to $62,090. Oof. That’s in the price range of the larger, significantly more powerful Audi SQ5. However, choosing a P250 model and being prudent with the options can go a long way toward making an E-Pace a better dollar value—the base model starts at $38,600, and if you’re willing to forego some of the fancier creature comforts, you should be able to have a nicely equipped E-Pace with a bottom line under $50K—still a bit steep compared to some class competitors, but not a bad deal for a hip, truly premium urban runabout that sits at the forefront of modern luxury. 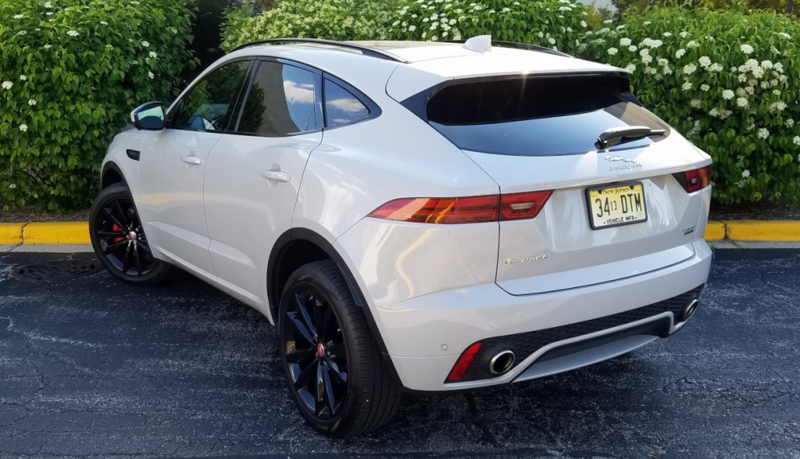 Jaguar’s all-new E-Pace is a nicely executed entry into the burgeoning “extra-small” compact luxury crossover SUV segment. However, it’s hard to justify the $62,090 price tag of our test vehicle when there are larger luxury-brand SUVs that offer more power and more space–and similar real-world fuel economy. Written by: The Daily Drive staff on July 26, 2018.on July 31, 2018.